Le Creuset cast iron products are second to none and this amazing value cast iron grill pan is no different. 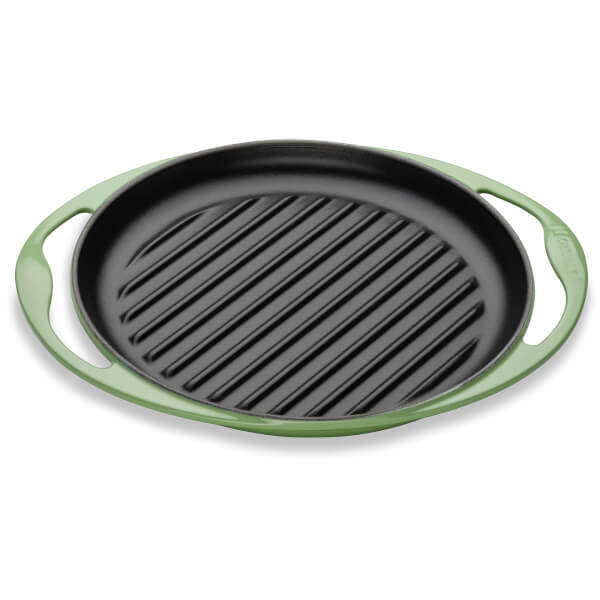 Ideal for quick and low-fat cooking, the round grill is perfect for searing chicken, steaks, fish, vegetables, and much more. Together the round shape and surface with a slim designed profile give a very attractive piece of cookware. The ribbed base will give you distinctive char lines on grilled food and allows any juices and oils to drain away from your food. The round grill’s interior is coated with Le Creuset's protective satin black enamelled finish requiring no seasoning and ensuring flavours are at their best. Extremely durable, this long-lasting enamelled surface will withstand high grilling temperatures and will not wear off, peel or deteriorate. Over time, it will develop a natural patina that is ideal for searing and frying. Suitable for use on all heat sources, including induction, and in the oven.